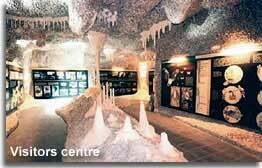 The Caves of Sorbas, Cuevas de Sorbas, are located in the Gypsum Karst Natural Park of Sorbas, a landscape of surface and underground rock formations, which was declared a Natural Area of Protection 1989. 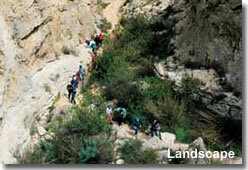 The caves can be visited on guided excursions and offer a thrilling destination for a day trip in Almeria. These caves certainly have the wow factor for appearance, adventure and excitement, but add to that a little understanding of how the Gypsum Karst came to be what it is today just adds to the pleasure of the whole experience. Gypsum - is a common mineral found in sedimentary rock environments, it can occur as a fine grain, en masse as mineral beds, or in crystalline form. Crystals of gypsum are usually colourless or white, tubular or bladed in shape, and in ideal slow growth conditions can grow to an extremely large size. Karst - a landscape of specific surface and underground formations, usually developed in carbonate rock, formed and shaped over time as layers of the bedrock are dissolved by the action of river waters and rain. Gypsum Karst Caves - are very rare, formations are always very young in geological terms, as the mineral Gypsum is quite soluble and rain water will revert the development process very rapidly. Here in Sorbas, the distinct lack of rainfall has significantly reduced gypsum degradation making Sorbas Caves are one of the best preserved Gypsum Karst sites in the world. An amalgamation of caves and underground channels covering an area of around fifty kilometres, the surface of the terrain displays a multitude of distinctive sinkholes which form a natural entrance to some of the chambers and tunnels. For centuries mineral water has been slowly dripping from the overhead rocks forming what we know as stalactites, which hang from the cave ceiling, it is from these drips on contact with the cavern floor that the stalagmites rock formations have grown vertically from the ground. Where the stalactites and stalagmites meet, they have form cohesive columns of rock blocking off cavities holding internal gypsum crystal formations, like treasure caves. Inside the Cuevas de Sorbas the marvels of the gypsum crystals, stalactites and stalagmites, that are manifested in abundance, are revealed. 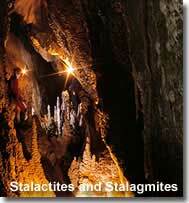 This is a subterranean world and one of the geological jewels of Andalucia. Of the known caverns, the Cueva del Agua is the largest one, being approximately eight kilometres in size, and the Cueva de Covadura is the deepest, reaching a depth of one hundred and twenty metres. However, the Cueva del Yeso and the Cueva del Tesoro, the Gypsum Cave and the Treasure Cave, are by far the most spectacular. 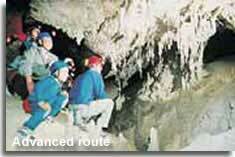 Guided tours offer access to the caves, the Gypsum Cave can be visited on both the Simple Tour and the Combined Tour and the Treasure Cave exclusively on the Technical Tour. There are three guided tours available to the general public, all of which have to be pre booked and are available in English. Equipment is supplied and included within the price. Clothing and footwear should essentially be comfortable and non restrictive, for example a tracksuit or jeans and t-shirt, besides climbing or walking boots, trainers make ideal footwear. Duration - approximately 1hr 30mins to 2 hrs. Suitable for all the family from age 3yrs and upward. This mostly horizontal route can be accomplished by anyone who is reasonably agile, a small amount of climbing and crawling is involved. 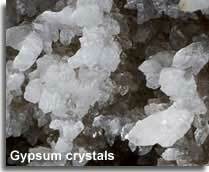 A chance to admire the remarkable gypsum crystals and rock formations travelling through the gypsum cave galleries. Duration - approximately 3hr 30mins to 4 hrs. This route is recommended for those wishing to experience a more involved caving experience, it requires a couple of metres of crawling and climbing through narrow tunnels. 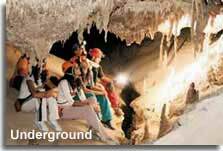 This exhilarating route travels through two different cave galleries, the same as the basic route, it traverses through the gypsum crystal caves, but also includes the impressive galleries of stalactites and stalagmites. Duration - approximately 4hr 30mins. Suitable for adults only of 12yrs plus. This route is a real challenge, one for the adventurer, just remember that the guides are fully experienced and are present throughout. The entrance to this route can cause a certain amount of trepidation for the visitor, it necessitates entering a narrow tunnel by means of an opening in the ground of just over 1m wide. 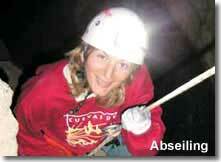 The itinerary also presents an 8m abseil down to the targeted destination. Of course instruction, equipment, and assistance is included. The effort is worth the reward, arrival at the Gypsum Karst Treasure Cave, and the awesome sight of the large gypsum crystals, stalactites and stalagmites. Whichever route you choose this is a one in a million adventure trip that is not only out of this world, but actually inside it! Discounts for group bookings of over 20 people are available. There must be a minimum of 4 persons per route (not necessarily from the same party). The restaurant is situated in the grounds of the Natural Park and can be booked in advanced to tie in with the caving tours, beside the 3 course daily menu, menu del dia, there is a menu for children. Of course it is possible to enjoy dining here without having taken a tour, or relax with a drink on the terrace that affords views out to the Natural Park. The restaurant opens every day of the year, in the summers months, which run from from 15th July until the 15th September, it is open all day, including the evenings, in the remaining low season months the restaurant closes at 6pm. VISITORS CENTRE There is a dedicated visitors centre situated in Sorbas village, Centro de Interpretacion Los Yesares, where phases of the formation of Karst are explained with the aid of exhibits. 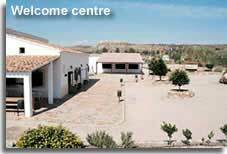 The centre also provides maps and books, and details of the Sorbas walking trails. 11.00 - 14.00 & 16.00 - 18.00 Thursday to Sunday from October to March. 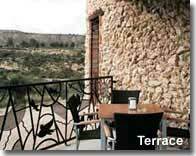 ADDRESS: Calle Terraplen, Sorbas Village. HOW TO BOOK YOUR CAVING TOUR It is possible to book online, though at the moment this facility is only available in Spanish and ONLY for the Basic Route and the Combined /Advanced Route. 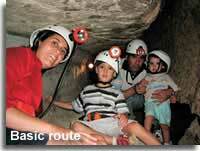 Tours can be booked by telephone using the phone number detailed below for Cuevas de Sorbas. 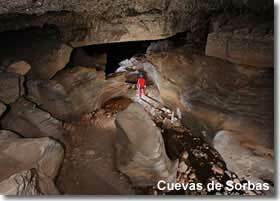 Further information is available, in English, on the Sorbas Caves website. 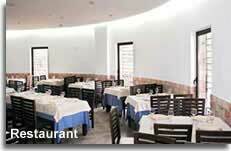 ADDRESS: Cuevas de Sorbas, Paraje Barranco del Infierno, 04270, Sorbas. LOCATED: The site is signposted along the A-1102 approximately 2 kilometres from the town of Sorbas. The AL-140 roadway links the main Almeria highway to the caves, it also makes for a dramatic and scenic drive through the natural park, at the highest point of the route, the Mirador Urra, presents a panoramic viewing point with far reaching views of the area. Access to this road is at junction 504 of the AP-7 motorway. Discover the Karst landscapes on foot, on one of the regions signposted walking trails. Images and information courtesy of Natur-Sport Sorbas S.L. Paraje Natural Cuevas de Sorbas.